We have always relished Dosas (Rice and Lentil Crepes). If you go to a South-Indian restaurant you will find a variety of dosas in the menu. From plain to masala to mysore masala to cheese and the list goes on. 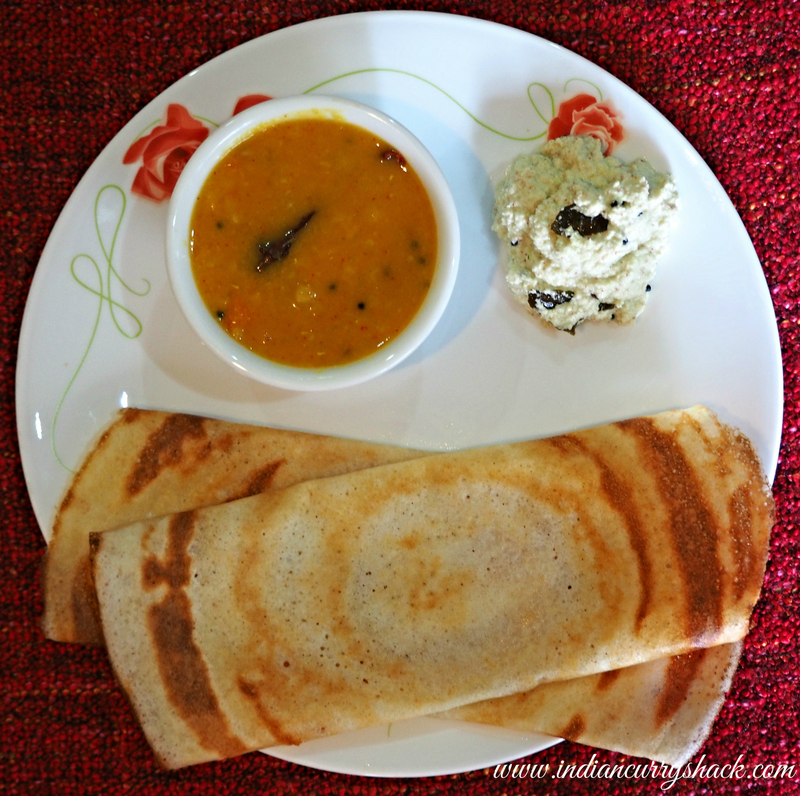 The recipe I am sharing today is that of a Plain Dosa. It is crispy and tastes divine with Coconut Chutney and Sambhar (Spicy Lentil Curry). It is very easy to convert a plain dosa to a masala (spiced) dosa. You can keep the masala/stuffing ready beforehand by pan frying roughly mashed potatoes with cumin seeds and sliced onion with salt, turmeric, chilli powder and any other spices you like. Later, you can just place a big spoonful of it on one side of the plain dosa and cover it with the other. Simple, isn’t it! Let me know should you have any queries about Masala Dosa. For the Batter – Rinse the Split Black Lentils (Urad Dal) and Rice separately. Soak the Split Black Lentils (Urad Dal) and Fenugreek Seeds (Methi) in enough water. In another bowl soak the Rice in enough water. Soak both for about 3-4 hours. Grind the strained Split Black Lentils (Urad Dal) and Fenugreek Seeds (Methi) to a smooth and fluffy batter (you can use a few spoons of water if the mix is too thick). Grind the strained Rice to a smooth batter too (use a few spoons of water if the mix is too thick). Mix both the batters together along with some salt. Cover lightly and let them ferment for 7-8 hours. After fermentation the dosa batter rises and almost doubles up. For the Dosa – Heat a nonstick pan/griddle. Drizzle some drops of oil and wipe the pan with a tissue paper or a kitchen cloth (this is done only the very first time when you start to cook the dosas). Then pour a ladle/big spoon full of batter into the pan and spread it evenly and thinly in a circular motion using the back of the ladle (as shown in the photo above). Drizzle a few drops of oil all over the dosa and brush with some butter all over immediately. Once the bottom side starts becoming golden brown (about 2 minutes) flip the dosa and cook from the other side for 1-2 minutes. Flip again. Cover one half of the Dosa with another or both the sides towards the centre and serve it hot with coconut chutney and sambhar (lentil curry). My better half enjoys plain dosa with tomato ketchup or mint and coriander chutney too. Repeat the steps for the remaining dosas. After each dosa lower the flame and sprinkle a few drops of water on the nonstick pan/griddle so that it’s temperature comes down. It is easier to spread the batter when the pan is not too heated. After spreading the batter you can increase the flame and cook the dosa to nice golden brown.